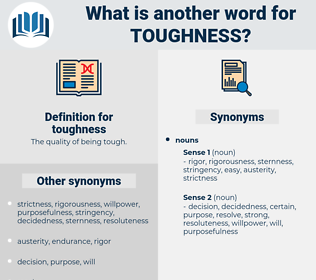 What is another word for toughness? 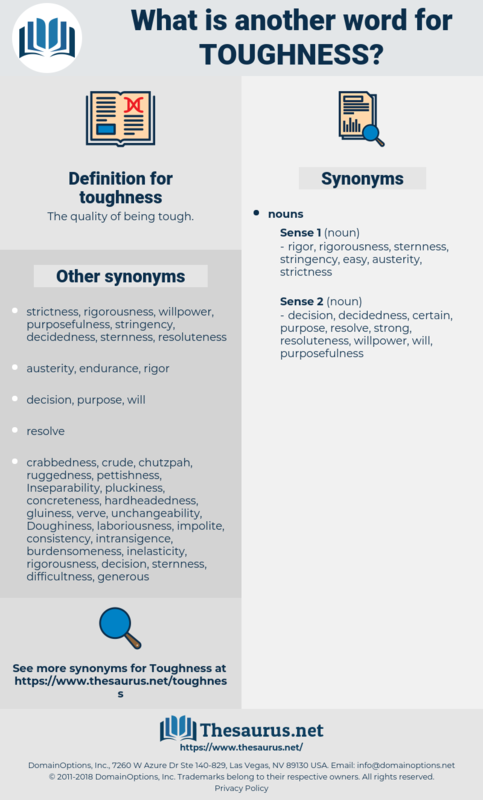 The quality of being tough. resistance, perseverance, hardship, durability, brutality. hardness, harshness, stamina, tenacity, robustness, steadfastness, strength, strictness, resilience, severity, thoroughness, rigour, endurance, firmness, stringency, roughness, persistence, resiliency, rigidity, fortitude, inflexibility, determination, rigor, meticulousness. He possessed, besides, that hereditary toughness and bulk which no gymnasium training will ever quite supply. One often wonders at the " amazing toughness" of tradition, and in the psychological conditions which have been indicated will be found one of the necessary explanations.